Vegan Peanut Butter Chips - Healthy & Homemade! And they literally MELT in your mouth! But be warned: they are quite possibly more addictive than the most addictive thing you’ve ever eaten. There are no partially-hydrogenated oils, refined sugar, artificial flavors, or corn syrup solids in these vegan peanut butter chips, and they honestly do taste a million times better. Once you try homemade, you will never go back! You only need 3 ingredients for these melty pb chips. However, you will want to eat them all without sharing, so be sure that you plan accordingly. Do you remember Earl, my alligator who protects my food? I’m now willing to rent him out to whomever offers me the most chocolate in return. Do you ever worry about food thieves? When someone in his office stole Ross’s sandwich (on Friends), I figured it was just exaggerated slapstick comedy. But in my first year of college, I learned those types of food thieves really do exist. Girls in my dorm took to writing on their containers, “I have a cold. Steal my food and you’ll get my germs,” yet the thieves still persisted. My roommate says it happens in her office as well, with people routinely taking coworkers’ lunches. Thankfully, the only one who ever steals my food nowadays is Henry. Peanut butter chips recipe: Melt the first ingredient if it’s not already liquid. Combine all ingredients in a bowl, and stir well to form a paste. (Note: I personally much prefer the taste of the chips when made with coconut oil. However, use the cacao butter if you wish to bake with the chips.) 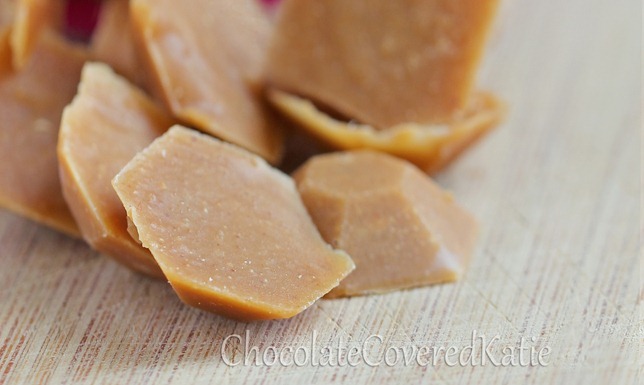 Smooth into candy molds or onto a sheet of wax or parchment paper, and freeze until solid. 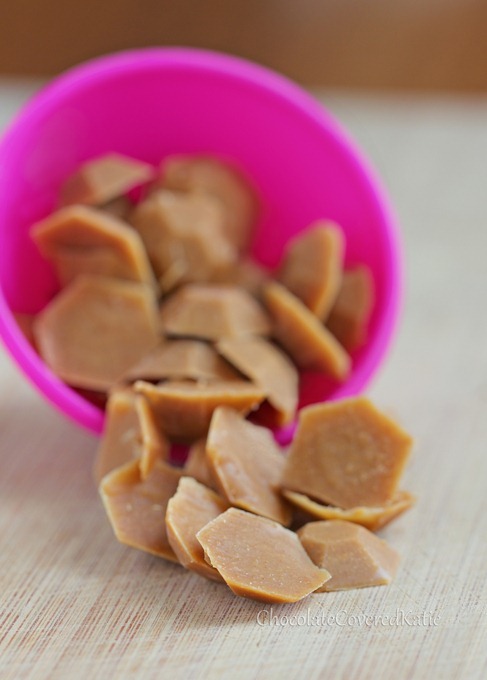 If using the wax/parchment option, break chips into pieces once fitm. The coconut version of these vegan peanut butter chips should be stored in the freezer; the cacao butter version can be stored in the fridge, freezer, or at room temperature. 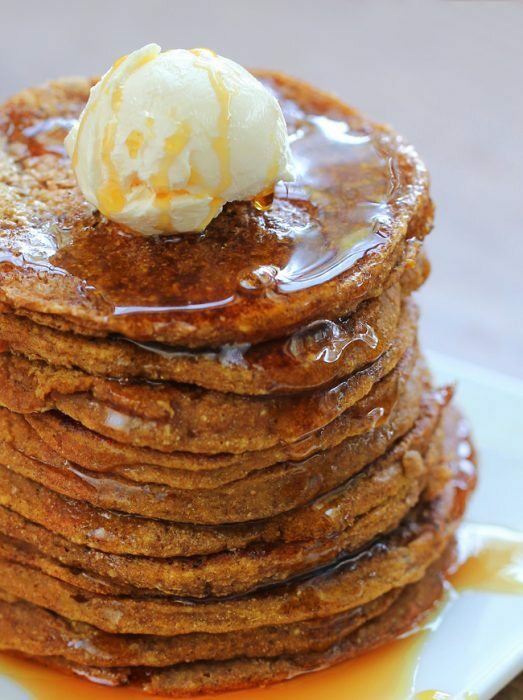 Soft, fluffy, irresistibly delicious & healthy pumpkin pancakes – Only 250 calories for the entire batch! I love how EASY these look to make! Definitely adding these to the bookmarks to make soon. This is one of those recipes that looks so good and simple I almost wish I hadn’t seen it because I know it’s gonna get me in trouble! I like how they look like little jewels. 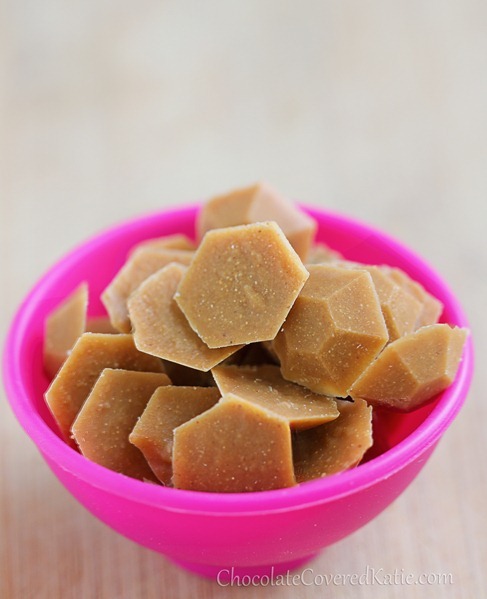 Little peanut butter jewels. Do you think they would melt if I made them into one of those candy necklaces? Or a bracelet? They probably won’t last long enough for that. If you use the cacao butter version, I think it would work. Maybe not outside, in the middle of the summer, but if you’re indoors it should be fine. I love the shape of your chips! They’re cute! 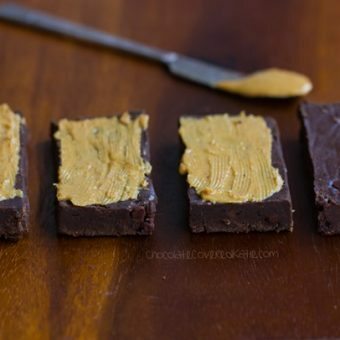 YUM, I love just about anything with PB in it!! 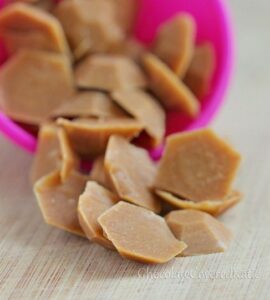 These look so tasty, and its amazing how cute they turned out considering there is only 3 ingredients! Looks like you spent half a day making them in a confectioner’s shop! I love that these have no hydrogenated oils in them! I hate peanut butter that has them so this is fantastic! Thank you for what you do. Everything I have ever tried has been wonderful! What a fabulous recipe!!! Thank you! It doesn’t have anything added to it (like PB2 does) and it is a little higher in protein. I think it is the same one Trader Joe use to carry. Ohhh what a fabulous idea! 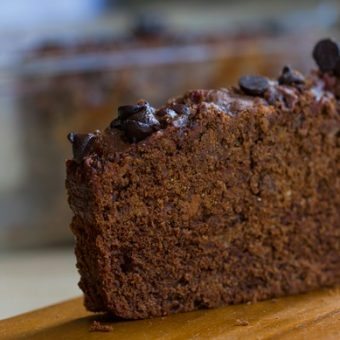 I’ve only done this with cacao powder and coconut oil, but never thought of peanut flour. Love it. These looks great! I’m very careful to stay away from hydrogenated oils. Thanks! 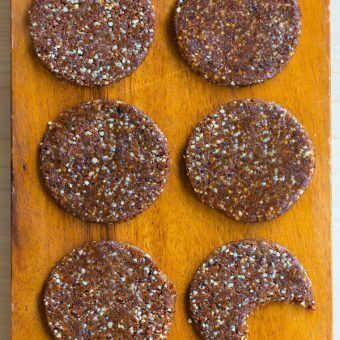 Would these work in cookies or brownies? Yes, the cacao butter version. 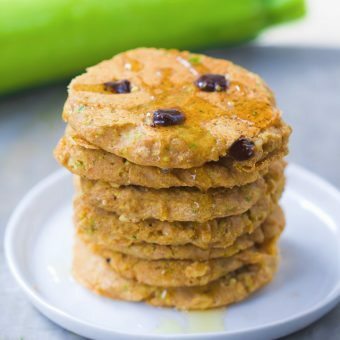 Ooh I love that you made these with peanut flour! I can only imagine how melt-in-your-mouth they are – coconut oil has that effect on everything. Amazing! Oh my goodness, this recipe just made my day! I had all the ingredients (I went with the coconut oil) on hand and I’m about to eat the entire batch without sharing! They are so yummy!